Al Qaeda leader Abu Ghadiya was killed in yesterday’s strike inside Syria, a senior US military intelligence official told The Long War Journal. But US special operations forces also inflicted a major blow to al Qaeda’s foreign fighter network based in Syria. The entire senior leadership of Ghadiya’s network was also killed in the raid, the official stated. Several US helicopters entered the town of town of Sukkariya near Albu Kamal in eastern Syria, just five miles from the Iraqi border. US commandos from the hunter-killer teams of Task Force 88 assaulted the buildings sheltering Ghadiya and his staff. The Syrian government has protested the attack, describing it as an act of “criminal and terrorist aggression” carried out by the US. The Syrian government claimed eight civilians, including women and children, were killed in the strike. But a journalist from The Associated Press who attended the funeral said that only the bodies of seven men were displayed. The identity of Ghadiya and several members of his senior staff have been known since February 2008 when the US Treasury identified Ghadiya, his brother, and his two cousins as members of the network. 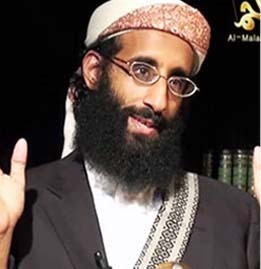 The US Treasury department publicly designated Ghadiya, his brother, Akram Turki Hishan Al Mazidih, and his two cousins, Ghazy Fezza Hishan Al Mazidih and Saddah Jaylut Al Marsumis as senior members of al Qaeda’s foreign facilitation network. Marsumi was an al Qaeda financier who “facilitated the financing and smuggling of AQI foreign fighters from Syria into Iraq.” He helped Syrian suicide bombers enter Iraq, and also wired hundreds of thousands of dollars to Ghadiya to facilitate operations. Syria has long been a haven for al Qaeda as well as Baathists who fled the US invasion of Iraq in 2003. Terrorists and insurgents took advantage of the long, desolate, and unsecured border, which stretches more than 460 miles along Iraq’s western provinces of Anbar, Ninewa, and Dohuk. 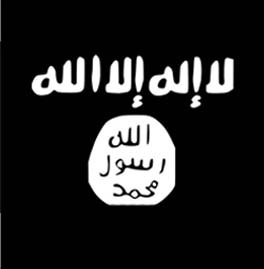 At the height of the Iraqi insurgency, an estimated 100 to 150 foreign fighters poured into Iraq from Syria each month. Operations in Anbar and Ninewa have pushed that number down to 20 infiltrators a month, according to the US military. 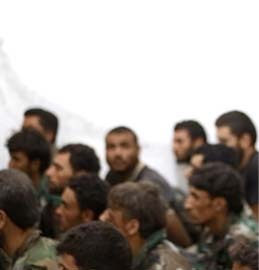 Wanted insurgent leaders, such as Mishan al Jabouri, openly live in Syria. Jabouri, a former member of the Iraqi parliament, fled to Syria after being charged with corruption for embezzling government funds and for supporting al Qaeda. From Syria Jabouri ran Al Zawraa, a satellite television station that aired al Qaeda and Islamic Army of Iraq propaganda videos showing attacks against US and Iraqi forces. Al Qaeda established a network of operatives inside Syria to move foreign fighters, weapons, and cash to support its terror activities inside Iraq. An al Qaeda manual detailed ways to infiltrate Iraq via Syria. The manual, titled The New Road to Mesopotamia, was written by a jihadi named Al Muhajir Al Islami, and discovered in the summer of 2005. The Iraqi-Syrian border was broken down into four sectors: the Habur crossing near Zakhu in the north; the Tal Kujik and Sinjar border crossings west of Mosul; the Al Qaim entry point in western Anbar; and the southern crossing at Al Tanf west of Rutbah near the Jordanian border. Islami claimed the Al Tanf and Habur crossing points were too dangerous to use, and Al Qaim was the preferred route into Iraq. The US military learned a great deal about al Qaeda’s network inside Syria after a key operative was killed in September of 2007. US forces killed Muthanna, the regional commander of al Qaeda’s network in the Sinjar region. During the operation, US forces found numerous documents and electronic files that detailed “the larger al-Qaeda effort to organize, coordinate, and transport foreign terrorists into Iraq and other places,” Major General Kevin Bergner, the former spokesman for Multinational Forces Iraq, said in October 2007. Other documents found in Muthanna’s possession included a “pledge of a martyr,” which is signed by foreign fighters inside Syria, and an expense report. The pledge said the suicide bomber must provide a photograph and surrender their passport. It also stated the recruit must enroll in a “security course” in Syria. The expense report was tallied in US dollars, Syrian lira, and Iraqi dinars, and included items such as clothing, food, fuel, mobile phone cards, weapons, salaries, “sheep purchased,” furniture, spare parts for vehicles, and other items. The Combating Terrorism Center at West Point later conducted a detailed study of the “Sinjar Records,” which was published in July 2008. The study showed that al Qaeda had an extensive network in Syria and the Syrian government has allowed their activities to continue. Al Qaeda established multiple networks of “Syrian Coordinators” that “work primarily with fighters from specific countries, and likely with specific Coordinators in fighters’ home countries,” according to the study. The Syrian city of Dayr al Zawr serves as a vital logistical hub and a transit point for al Qaeda recruits and operatives heading to Iraq. A vast majority of the fighters entering Iraq from Sinjar served as suicide bombers. The Combating Terrorism Center at West Point estimated that 75 percent conducted suicide attacks inside Iraq. Is this a message for Iran? I hope so. Wow, even if we didn’t get al-Masri this strike was definitely worth it. Way to go guys! if the public report is correct and the head honcho was killed rather than captured, that’s the only thing that could have been better. It would be interesting to know which part of 88 went in. SEAL’s or Delta I mean. Nice job beating the MSM to the punch on this. You clearly have some very well placed sources. Next time ask for the storyboard! This is great news because it shows a great deal of latitude given to onsite commanders who in previous wars were reluctant to go after targets in third party states. Just makes me wonder what we’re not hearing about on the other side of the border, I do imagine its better controlled or we just haven’t caught a big enough fish yet. I can assure you that the ISA had hunted down and located the terrorists, then the special ops killers eliminated the targets. If we go to war with Iran, the military should already have a good game plan. ISA has been operating in Iran, off and on, for several years. The CIA is still too risk adverse and don’t have the will to work in hostile places such as Iran, Syria,etc. The ISA was the intellegence agency that hunted down al Zaqarwi, by tracking his keystrokes on inetrent cafes. The message needs to be sent a message and done so in a crystal clear manner, the clerics die first,followed by the Revolutionary guard. To allow Iran to gain long range nuclear strike ability is not an option. Good story Bill! GOOD WORK TROOPS KEEP KILLING HIRABI’S!!! Excellent work, Bill. I can feel you have really gained the respect of your sources. Pardon my ignorance, but what is ISA? I agree though that some kind plans probably have been drafted up to defend Iraq from Iran if necessary. Iran basically used World War I tactics in the 1980-1988 war–human waves against machine gunners. IA is leaps and bounds more trained than what it used to be but lacks armor–but if defense is the goal and not power projection, perhaps Stingers and Javelin’s deployed properly could do the job. Later news reports indicate the CIA also played a key role in the Syria raid. A CIA-led raid on a compound in eastern Syria killed an al Qaida in Iraq commander who oversaw the smuggling into Iraq of foreign fighters whose attacks claimed thousands of Iraqi and American lives, three U.S. officials said Monday. Did you see this moron suggesting it was all just an attempt to help McCain get elected? This is great news to see the creeps get blown away. This must completely trash their self- confidence. They will have trouble sleeping now. Time for them to worry and wake-up tired. Even though some in the press are inclined to give deeper political meaning to the latest strikes, it looks to me that these are intelligence driven. They seem to be getting better intelligence penetration of these networks in several different countries. This has been in the works for some time. I would imagine the intelligence effort dedicated to the war is huge by this time. One big positive of having the war in Iraq whined down is that assets can be shifted elsewhere. Intelligence efforts can be broadened to include adversaries outside Iraq that are fueling the conflict. I think you are just seeing the fruits of more material and personnel being dedicated to breaking these networks up. As for the criticism, I guess some will always complain whatever action is taken. They complain that we should be spending less time fighting regional wars and more going after the top terrorists. Than when the US government does take down terrorist cells the same critics will turn around and complain about undue escalation, the perception of unjust attacks, and collateral damage. No satisfying some people. I don’t understand how this town can be so different from NWFP. It’s been suggested that to send troops into nwfp would result in a bloodbath, we seem to do everything from the safety of the drones. Yet here we read that we flew four helicopters into town harboring Al-qaeda during daylight hours with a handful of troops moving about clearing buildings, etc. Outstanding work men! I tear up when I think of your pure bravery. Our country walks with more and more courage these days because of your heroic work! I only wish that I could show up with the water and the board to assist these innocent pita vendors give up some firm intell. I’d have never thought to include a “sheep purchased” category in an expense report. What are they doing with all those sheep? The reason this could be done with Syria (this time) and not with Pakistan is because of our on-going status with Pakistan as our “ally” in the war. If an ally says, don’t come across my border, it is much more impt to respect it, even when the border is outside of the ally’s control. In the case of Syria, although, even there we do care what the Syrian’s think and want to negotiate them away from their miscreant waves, it seems this raid served more than one purpose. The primary purpose was that a HVT was in a confirmed location and could be taken out and intelligence gained with a raid. My guess personally is that the political implications, while considered, were secondary. The Thunder Run has linked to this post in the blog post From the Front: 10/28/2008 News and Personal dispatches from the front and the home front. 1. Syria is not the route we send our supplies thru to Iraq. NWFP is the route to Afghanistan. 2. Syria is no ally. Pakistan is at least in name. 3. Eastern Syria is flat and only has 3rd tier units. NWFP is mountans and is a fighting front. 4. Syrian military is not as good in a fight and (per item 3) the worst are stationed in eastern Syria, the best opposite Israel. 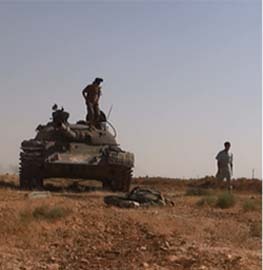 – much better in a fight than the 3rd tier Syrian Army units in eastern Syria. In other words: Geography and politics. This compound must have been under surveillance for awhile now. To get everyone in the group is a major coup. I would like to see more ops like this along the tribal belt in P-stan, where the real problem is. The civilian gov. of P-stan says one thing, the ISI and Army do another. Until the sanctuaries in P-stan are not safe anymore, A-stan will remain unstable. The P-stani’s are not interested in terror groups that threaten the US, Europe, A-stan, they WILL fight against those whose goal it is to overthrow the P-stani Gov. The US/UK must act if the host country allow the parasite to conduct ops with impunity, launching attacks into A-stan, killing US, UK, Dutch and Canadian soldiers. We have an obligation to protect our forces, despite wat the double dealing P-stani’s whine and moan when we do. Airstrikes. For 10 days straight, hitting all or most of those 160 terror training camps. How long can we let this go on? Better find a new logistics route, coz we may be headed for some kind of confrontation with the 2 faced P-stani DOGS. Lite ’em up. Sometimes the Syrian regime flacks are hilarious. How can you stand up and say this stuff like you mean it? Syria denied on Tuesday that a U.S. raid inside its territory had targeted an al Qaeda operative as alleged by a U.S. official. “What they are saying is just unjustified. I deny it totally,” Syrian Foreign Minister Walid al-Moualem told Reuters. Perhaps they are policemen, but the recent video of the aftermath of the attack shows men carrying AKs in civilian dress mingling with armed security forces. 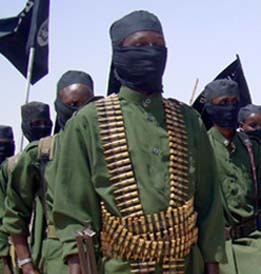 Could Al Qaeda be walking around in the open bearing arms? I think the intelligence is gwetting better for a couple of reasons. One is that the Iraqis are joining us in greater numbers to combat terrorism and take back their country. The other is the language barrier. We just did not have enough translators to hear and know what the enemy is doing. The Iraqis are now doing the listening and reporting what the enemy is up to. I think we have a similar problem in Afghanistan as they speak a different language and we are still not up to speed there in translating capabilities. Congratulations to our brave soliders and for a mission accomplished! Speaking of big fish, does anyone know whatever happened to Izzat (Ezzet) Ibrahim al-Douri, the red-headed Baathist and former Saddam henchman who fled to Syria in 2003? The last I heard about him was that he was pulling strings–and apparently had a huge amount of Saddam’s loot to do this–for the insurgency. This seems too good to be true, but still very interesting. Publicly America is still saying nothing but US officials are making intriguing claims off the record. Now, a respected Israeli intelligence expert says he has been told the operation was carried out with the knowledge and co-operation of Syrian intelligence. Ronen Bergman, author of The Secret War with Iran, makes the claim in the Yediot Ahronoth newspaper, based on briefings with two senior American officials, one of whom he says until recently “held a very high ranking in the Pentagon”. I also wondered what happened to Al-Douri. He was the leader of the Iraqi (non Al Qaeda) insurgency. He was reported dead of illness, then resurfaced apparently pulling together various Iraqi factions under one banner. I also suspect some of the loot he has is coming from Saddams Daughter Raghad who was living in Jordan. She probably fled with a lot of loot and would be a contact for Al Douri, especially for cash. The McClatchy article names one Maura Connelly as the State Department representative chosen to receive the displeasure of the Syrian Foreign Ministry. It seems to me that this raid came only after the pressure was off concerning the ‘Status of Forces’ negotiations was lessened by the unexpected, yet welcomed initiative by Russia, suggesting to the United States, that if they couldn’t reach an agreement with the Iraqi’s by the expiration date (Dec.31st) of the UN Mandate, that we ask for an extension for say…one year. The Iraqis have been pretty difficult of late concerning this aggreement, and with the frosty relations with Russia, the US was doing it’s best to hammer something out with them before the end of the year. Now that the Russians are looking to get back into our good graces after the Georgia debacle, it looks as if it’s freed our hand a little to do whatever we want, and if the Iraqis don’t want to play fair then we can just stay there indefinately as nobody’s gonna veto the extension. Am I the only one to make this connection? Bill, can you confirm whether or not PM Maliki was informed about the Syrian strike in advanced? When was he informed about it. I am surprised to see Iraq condemn the attack on Syria, even while Iraq declares that the targets where AQ linked. How soon can the ISOF, Iraqi Air Force and IA replicate an operation like this on their own? 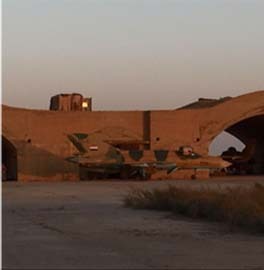 15th Special Operations Squadron of the Iraqi Air Force has been training since January and is due to get its own SpecOps configured Mi17v5 Helos in early 2009. Dedicated to supporting the Iraqi Special Operations Force. I see too much optimism and flag waving in most of these posts. We killed some top talent. Now, look at the results. Syria has reportedly dismantled some of its border posts on the Iraq border, so we can rest assured there will be an upsurge of terrorists into Iraq. Probably a lot more than the 8 we killed, especially if Syria turns a blind eye to this infiltration. Our raid has also come at an extremely poor time for the US/Iraq SOFA negotiations. Now the Iraqis are insisting that our bases in Iraq be prohibited from launching operations into other countries, among other sticking points. While I applaud our efforts to strike at these leaders who contribute to US casualties and Iraqi instability, this operation seems like a case of killing the golden goose. Nobody on this thread seems to have thought through the longer strategic implications of losing our bases in Iraq. Syria knows exactly what is going on inside its borders and allowed al Qaeda to set up its logistics network there. Syrian border posts already let AQ filter through. So what has changed? They already turned a blind eye to the infiltration. See above. I strongly recommend you read the entire report of the Sinjar Documents at the CTC. If you read the proposed SOFA, you would know it already prohibited the US from using Iraqi soil to conduct attacks. This was before the attack. I do agree, however that the timing was poor, in that it makes the SOFA more difficult for the political parties to swallow. RED! Keeping in mind of course that intel as defined is still basically Israeli in mind and spirit in everyone of these cross border cases. We simply do not see the fingerprints of conspiracy here. Lovely (and I do mean that in a very penal code sort of way) thought, it’s like having a murder case and no weapon. You can make the case however, we would all prefer to have the evidence in hand. For those who have pursued in this situation, reality sets in and diplomacy is always defined as the art of learning how to say the nastiest things in the nicest of ways. I do recall hearing a very credible case that Israel made for going to war with Iran, credible for Israel but not however for we, we referring to the US. Keeping in mind that war is best pursued under truthful, mindful evidence we avoid nasty problems with outside influences and don’t trip over our own feet. With that having been said, waterboard this one time and you will never have the want again. War is an extreme, not an embellished act for the media. To have a dead body in your hands is not always the do all, say all and end all, there is always the whole story.